Product Description: Find any part GUARANTEED. Finally, someone has done the research to make it easy to find anything for your Mopar. The largest source of parts information anywhere. 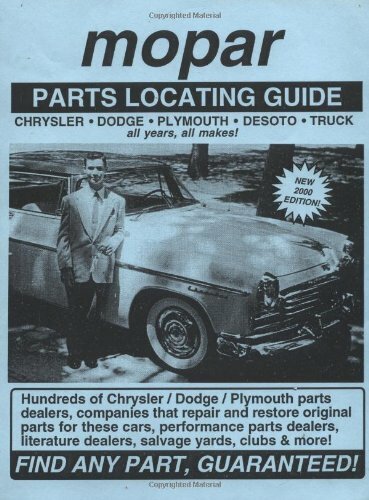 Thousands of new, used, & custom Mopar parts and literature dealers, clubs, specialty salvage yards and companies that repair & restore original parts. Organized to find what you need quickly and cheaply. Any year, any part, any Mopar. It's all in here! Over 80,000 books sold.